Constructed from neither plastics nor Polycarbonate sheathing, but has an especially high tensile nylon shell. The cable is properly circled by the nylon fiber cloth, which brings superior durability and flexibility as well. Nylon fabric can resist water in some way, but do not put it in water on purpose. High-quality four-core copper wires enhance charging & data transfer speed of the cables. Our technology ensures a faster charging time while keeping your device completely safe. Easy to carry, It suits every occasions, home, office, car and so on. 10 Feet Long: Long enough so that you can consistently enjoy the happiness your phone brings to you without worries about sudden power off or short length. Though this data cable is 10 FT long, it feels very light in hand. 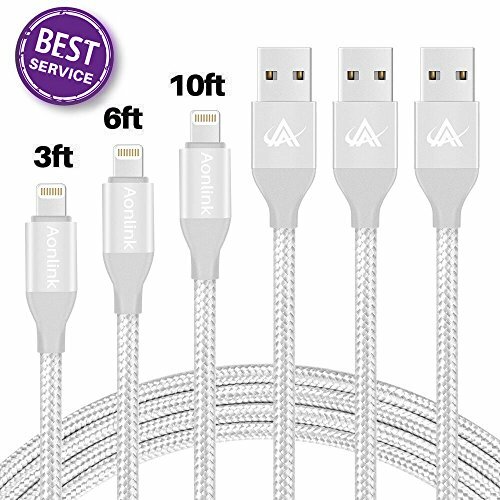 iPhone 7/iPhone 7 Plus iPhone 6s plus/6s/6 plus/6 iPhone 5s/5c/5/SE iPad Air/Air 2 iPad Pro/iPad mini/mini 2/mini 3/mini 4 iPod nano (7th generation)/iPod touch (5th generation) Package content: 3 X10 Feet nylon braided cables. 18 months worry-free product assure from sunnest which ensures long-lasting enjoyment of your purchase. please make sure the item sold by Aonlink to receive genuine product. If any question, please feel free to contact us, our service team will reply you with satisfied solution within 24hours. We are the maker, Quality first is our tenet. Current through cable shouldn't be more than 2.4 A, DC voltage through cable shouldn't be more than 5.0 V.
[Compatibility]Compatible with iPhone X/8/8 Plus7/7 plus/6/6S/6 plus/6S plus/iPhone 5/5C/5S/SE/iPad/Air/Mini/Mini2/iPad 4/iPod 5/iPod 7 rapid charging and data synchronization. [Nylon Braided]Highest standard of quality cables, covered by premium quality braided nylon,jacket.Flexibility, durability, portability of 2 m 3 m cable in daily what kind of scene, also can connect, use very convenient. [Great Charging Performance]Ordinary cable about 2 times of ~ 2.4 A output fast charging, charging time savings.Its durability, connectivity, compatibility, and performance is 100% Guaranteed. [Warranty Policy] Every sale includes an 18-month, worry-free guarantee to prove the importance we set on quality. If you have any questions, don't hesitate to contact us! [The High Quality]Used the compact heat resistant aluminium alloy terminals, high sense of improving quality. In addition, the surface of the nylon fiber weaving, rectifying around the difficult is not easy to break. If you have any questions about this product by Aonlink, contact us by completing and submitting the form below. If you are looking for a specif part number, please include it with your message.